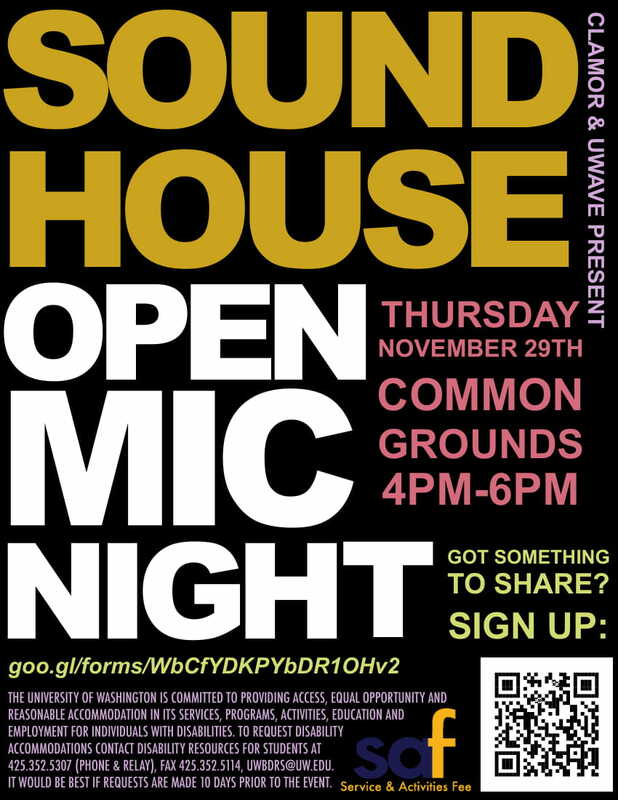 Thursday, Nov. 29, 2018, 4 – 6 p.m.
Sound House is an open mic night collaboratively hosted by Clamor and UWave. Join us for an evening celebration of creativity and expression at this year’s annual fall Open Mic Night! If you would like to sign up in advance, please do so through this link: https://goo.gl/forms/WbCfYDKPYbDR1OHv2 (Links to an external site. )Links to an external site. We will also be accepting walk-in submissions, but we recommend signing up before the event to secure your spot. UWave Radio is the campus-based community station of the Bothell area and beyond. We are a center for community engagement, a hub for underrepresented voices and music, an environment for professional development, and a catalyst for social justice. Note: Views and opinions expressed by student performers do not directly represent Clamor or UWave. The Open Mic Event’s purpose is to give a voice to all students. Some readers may present themes, ideas, or topics that might challenge your comfort zone. Please be respectful and aware to all performers and fellow audience members.